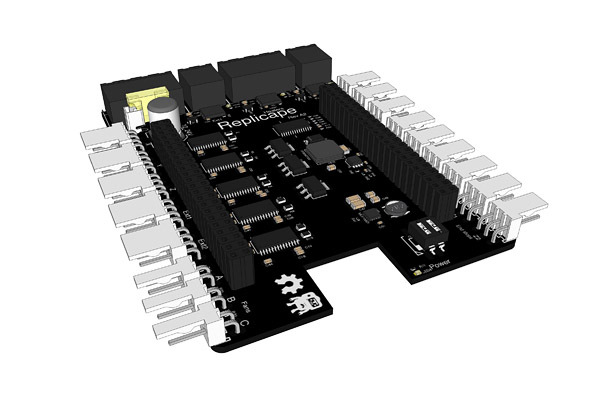 Replicape Revision A2 Updates for BeagleBone Black #3dthursday « Adafruit Industries – Makers, hackers, artists, designers and engineers! I’ve gotten a lot of help from Dirk Eichel on this revision, especially on the fat power tracks, the addition of a freewheeling diode across the MOSFETs to suppress voltage spikes and grips to reduce noise on the ADC lines. Although there are a lot of nice changes, there has also been a lot of work put into keeping the cost down. The total cost of the board is the the same (BOM is ~$90). I’ll give it a couple of days to get input from the community both on bugs in the layout/schematic and feature requests. Have a look at the RevA2 tag of the repository.